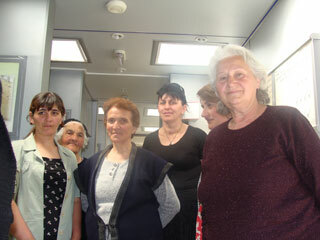 “Energy Efficiency Programme for Georgian Communities- Energy Bus Project” is Energy Efficiency Center Georgia (EEC) initiated and BP & partners and USAID funded a 3-year project which was focused primarily on rural communities, both adults and youth. 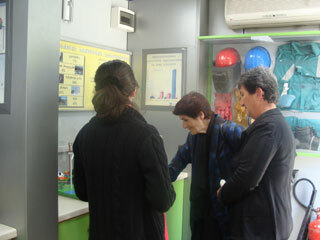 Its initial goal was to raise awareness of Georgian population on effective usage of energy, as well as to improve utilization of locally available renewable energy sources in order to decrease energy poverty and improve indoor environment through the energy information centre/exhibition on wheels, which serves as a highly effective tool for communicating the best practices in energy efficiency, and alternative energy technologies through on-board multi-media interactive displays and models of RE and EE technologies. 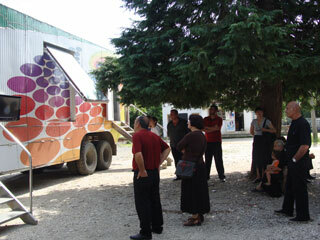 The Energy Bus (EB) Project was launched on March 23, 2009 and after visiting and exhibiting in Tbilisi districts from mid May started visiting the Georgian regions. 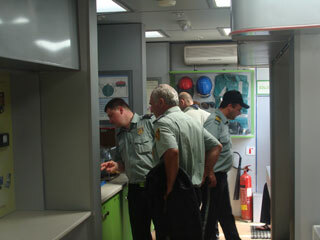 During the three years of operation Energy Bus visited twice all those regions and districts in Georgia where access roads permitted the EB safe movement. 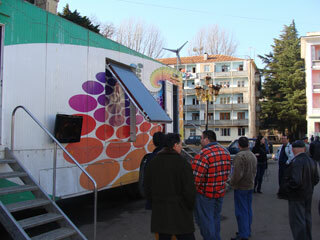 Energy Bus showed its exhibition to citizens of Tbilisi, Kutaisi, Batumi,Rustavi, Poti and 57 district centers/small towns and more than 400 villages throughout Georgia. 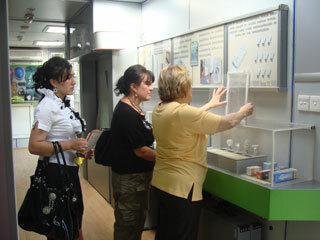 EB tour to both adults and the schoolchildren. 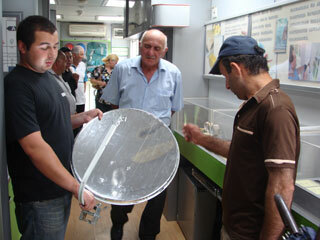 The visits to each settlement/town are orga nized with the assistance of the representatives of local administration. 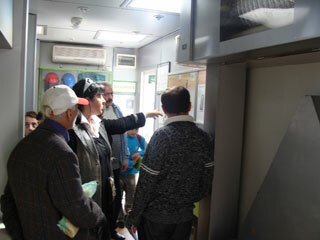 Announcements on the EB visits are put at places of public gathering. 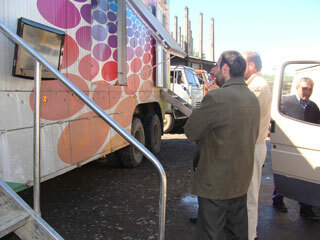 In every visited settlement the EB is usually parked in the central square in front of the local administration office or central square the most busy place for the particular location. By the end of April, 2012 number of EB visitors amounted to 62,938 persons including adults- 32,536 (75% men); kids- 30,402 (60% boys). Individual consultations for citizens on particular RE &EE application and loan opportunities; The project assistants and expert conduct EB tours for visitors and provide personal consultations. During the 3 years of operation about 1200 citizens were provided individual consultations on various RE &EE technologies. Before guided tour of the EB the visitors can watch short video films on various RE &EE technologies from the TV screen mounted outside the EB. 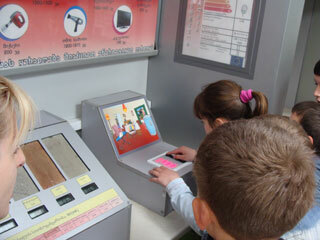 The trainings in schools to familiarize the children with RE &EE technologies and invite to the EB. The schoolchildren are offered the slide presentation covering traditional energy sources, climate change issues, renewable energy sources and energy efficiency potential and technologies for their application. 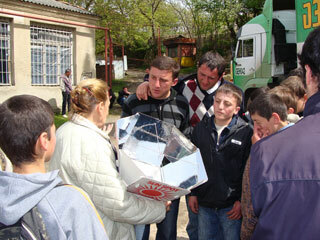 In the course of the project implementation Each visited school received the package of promotional materials: brochures, leaflets, posters and the CD with the short video films and computer games. In the course of project implementation 13154 schoolchildren and 1213 teachers participated in the training sessions organized in villages and towns throughout Georgia. During the trainings the announcement on the competitions for schoolchildren for the best thematic drawing/poster and project idea were made and children were encouraged to participate in national contests which had the annual character. More than 600 schoolchildren participated in national contests for best thematic poster & project idea by submitting 449 posters and 133 project ideas. Award ceremony of the winners usually took place during the Georgian Sustainable Energy Days. Media coverage. 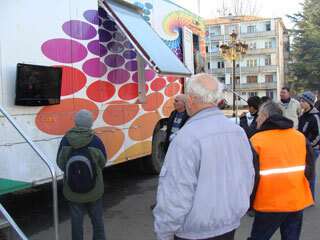 EB - mobile information resource center acted as one of the most powerful and efficient tools to promote RE & EE among the individual energy consumers (households), youth and media itself. Active involvement of media was essential and very important for the project success. Prior to visiting the district the PR Manager issued the press release for the media working in the particular district and invites them to the EB tours. During the tour the journalists are encouraged to take part in the annual national competition for the best article or TV spot on RE&EE applications. Since start of operations the Georgian journalists covered EB activities in 39 TV spots, 6 radio programs, 37 newspaper articles. 33 TV spots, 8 radio spots and 38 newspaper articles were submitted for national competitions for best media work organized within the project. 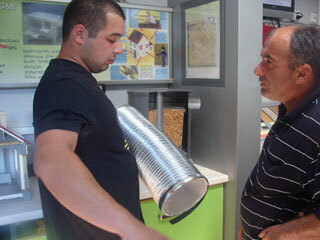 20 local companies displayed to more than 300 visitors RE & EE technologies, 2 thematic conferences organized within Georgian Sustainable Energy Weeks (20010 and 2011), which was covered by media in 25 TV spots, 9 radio spots and 13 newspaper and internet articles. 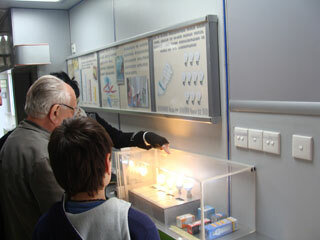 The winners of the competitions for media and schoolchildren are awarded with prizes during the Georgian Sustainable Energy Days. In 2011 EB Project was selected by the Energy Globe jury from among almost 1000 projects from 105 nations and became the National Winner of the Energy Globe Award Georgia. Dissemination of promotional materials. The EB library offered its visitors specially designed brochures, leaflets, posters, thematic video films covering various RE& EE applications and computer games - “Build Your Own House” and “Change the Bulb”. About 135 000 copies of 6 types of brochures & 6 types of leaflets, 500 CDs with video films and computer games created within project have been disseminated. 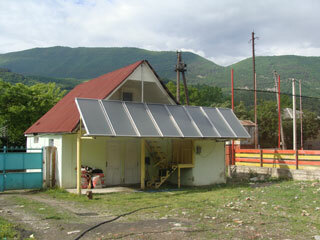 As a next stage of the EB project in the period 2011-2013 the implementation of several demonstration projects are planned, in particular: construction of micro hydro plant in Borjomi Historical Park, Introduction of Solar Thermal Systems in SOS Tbilisi Children’s Village and School for Deaf and Diminished Hearing Children, implementation of 15 small scale RE & EE demonstration community projects in various regions of Georgia. Project results, media coverage including illustrative material will be broadly publicized via web - EEC Georgia web-site, facebook, EEC Georgia weekly newsletter for all interested stakeholders to learn about the findings and achieved results, These activities will promote to more wide application of RE technologies throughout Georgia and in nearby countries.